Test flown as N130JQ. Also reported as N4080M. Photographed fitted with external fuel tanks. Emerged from the Douglas Aerospace paintshop at Wagga, the last C-130J to be repainted in the dark grey livery. From 2007. the C-130J fleet was progressively repainted from the original light grey scheme to a two tone dark grey scheme. Photographed fitted with a Ka-Band SATCOM system. Demonstrated at the Avalon Air Show as N4187W and later returned to the U.S.
Photographed carrying special tail art to celebrate 50 years of RAAF Hercules operations. Photographed with white ribbon tail art. Left outer wing was damaged by a crane during an engine change on an adjoining aircraft on an unknown date. Aircraft parked at Richmond and used for parts pending decision on depot level repair. Back in service by this date. The left wing was damaged in a storm at Richmond when the wing came down on a work stand. Repairs commenced using parts from A97-465. Photographed at Nellis AFB, Nevada supporting Red Flag. 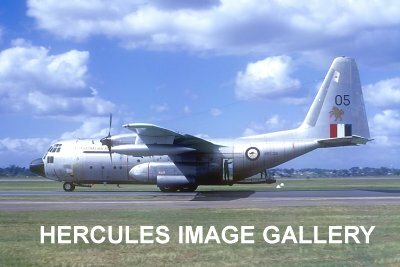 Links to Hercules images have been removed from this page. For images please visit the Hercules Gallery. Added images of N4187W and A97-468 thanks to Phil Vabre. Added individual aircraft names thanks to ADF Serials website. Added images of A97-449 and A97-466 thanks to Phil Vabre. Clarified the circumstances surrounding wing damage to A97-465 and A97-468. Thanks to Damien Bowley for this information. Added reference to A97-465 being repaired and returned to service. Thanks to Colin Tigwell. Added reference to A97-465 being withdrawn from service with wing damage. Thanks to Colin Tigwell. Added reference to storm damage to A97-468 thanks to the ADF Serials website. Recent deliveries added thanks to Darren Crick.